You might know Anheuser-Busch as the company that brews your favorite beers, but did y’all know they are one of the most charitable companies out there? Not only do they produce beer, malt beverages, and energy drinks, the company also produces bottled (and canned) water. There is a significant reason for the production of their canned water – natural disasters. For many years now, Anheuser-Busch has been giving back to cities all over the country that have been hit with floods, tornadoes, fires, hurricanes, and water crises, like in Flint, Michigan. 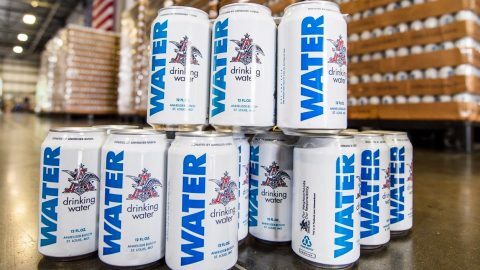 The company began donating emergency drinking water for disaster relief efforts in 1988 and have provided over 80 million cans in that time. One of their largest one-time donations was when they sent 480,000 cans to California, Puerto Rico and US Virgin Islands in 2017 during the wildfires (CA) and hurricanes (PR & USVI). Anheuser-Busch is now sending two truck loads, which adds up to more than 100,000 cans, to areas that were affected by the devastating flooding in Nebraska. The flooding was caused by heavy rains due to the “bomb cyclone” last week. Well done, Anheuser-Busch, for coming to aid for people in need. It’s not every day you see a company as large and as prominent as Anheuser-Busch stopping production to give back to those in need. If you’re a Budweiser drinker, you must be proud! Watch Anheuser-Busch’s 2018 Super Bowl commercial, which highlighted their disaster relief efforts.